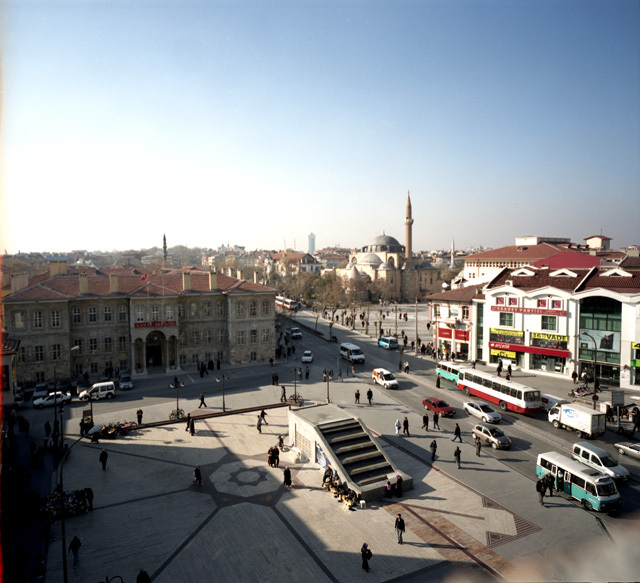 Benjamin in Konya was realized in 2009-2010 for British Council Turkey as part of the project My City. The point of departure was a reflection on the mechanism and consequences of the linguistic revolution that was decreed and carried out in Turkey in 1928. 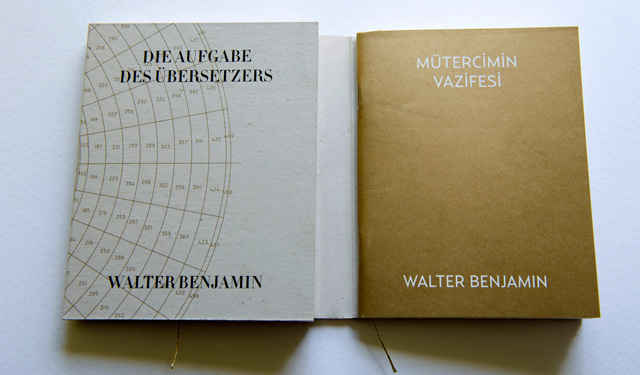 The artist decided to translate Walter Benjamin’s 1921 essay The Task of the Translator into the now-defunct Ottoman Turkish language. Published in 1923, the essay served as introduction to Benjamin’s German translation of Charles Baudelaire’s Tableaux Parisiens (‘Parisian Scenes’, part of the volume Les Fleurs du mal). The very year of the essay’s publication – 1923 – became an almost symbolic reference point because that was the year the Turkish Republic was proclaimed, starting a time of ‘great translation’ in the country’s culture. 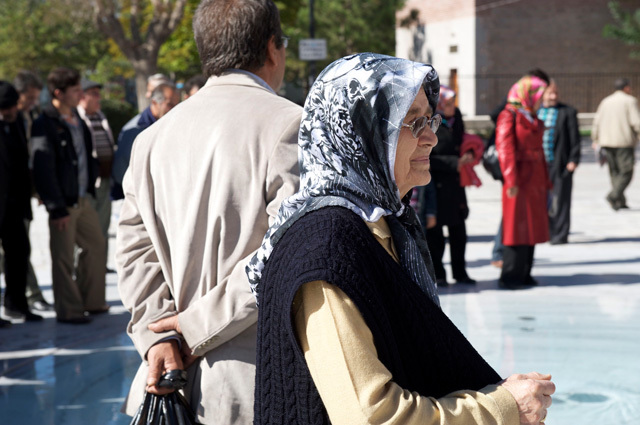 At the heart of the project is the question about what happened to the Turkish language and, consequently, Turkish culture and identity in the late 1920s, when Mustafa Kemal Atatürk began his groundbreaking reforms. In 1928, the Turkish leader launched a linguistic revolution, starting with a reform of the alphabet (dil devrimi) which replaced the Perso-Arabic script with the Latin alphabet. The next step was a reform of the Ottoman Turkish language itself, which irreversibly changed the Turkish vocabulary by replacing Arabic and Persian words with their Turkish equivalents or Western loanwords, and reintroducing Old Turkish words, some unused for centuries. This makes the actual content of The Task of the Translator, one of Benjamin’s most outspoken texts on language and translation, all the more important. In order to fully understand its significance, it is necessary to think about translation in the context of Benjamin’s theory, or rather theology, of language, which assumes that language not so much conveys meanings as contains them in itself, that meanings are immanent to language. A language that is just a semantic medium is an impure language, a degenerate form of pure language (reine Sprache). The latter, in turn, is a medium that guarantees communication with God and the world of objects. The translator’s task is therefore a messianic one – it is to bring back pure language through translation. According to Benjamin, man received from God the power to name things, thus becoming the first Translator. It is precisely the ability to call things by name that is the miraculous essence of language. Through the guilt of the original sin this power was lost and the tragedy of the Tower of Babel caused the originary unity of pure language to be shattered into a multitude of degenerate languages which are just an arbitrary system of signs lacking the power to name and to connect man with the world. Genuine translation should, paradoxically, point to the lack of primal unity between language and meaning, to the irreversibly lost identity of words and objects. ‘In this pure language’, Benjamin writes, ‘which no longer means or expresses anything but is, as expressionless and creative Word, that which is meant in all languages – all information, all sense, and all intention finally encounter a stratum in which they are destined to be extinguished’. The essay very strongly emphasises the theme of alienation. It is present, for instance, in the reflections on the word being alien to its meaning, or the translation to the original. It is precisely this theme, alongside that of the impurity of languages and the utopia of a return to pure language, that became a leitmotif in the artist's attempt to understand the Turkish linguistic revolution. Rajkowska asked a question stemming directly from reading the Benjamin essay: what happens with meaning when the visual form of text changes, when the word receives a completely new – in a way, alien – form? 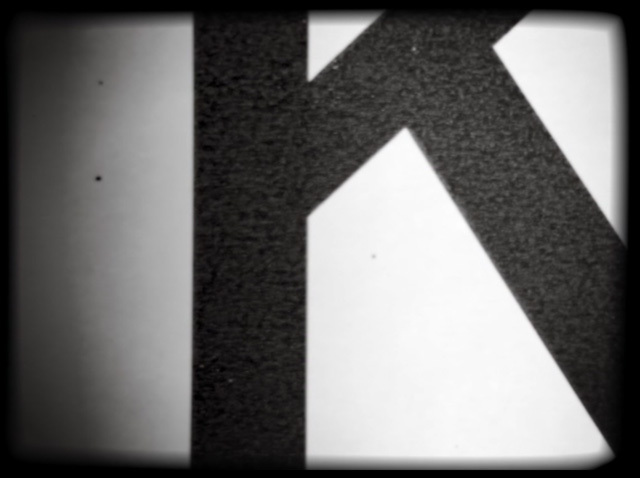 How does the shape of the letter, the rhythm of punctuation, the type of connections between words and letters, influence the process of understanding meanings, building associations? What happened to the Turkish language, Turkish culture, when the linguistic revolution was decreed? What happened within the whole sphere of visual culture, textual culture? 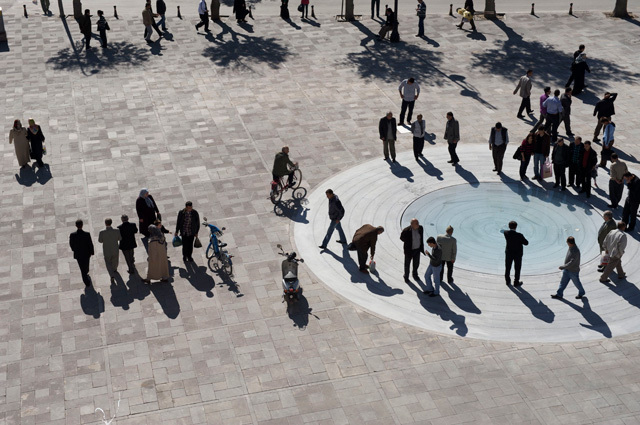 Benjamin in Konya was meant not so much as a conceptual gesture as, in the first place, a public project. 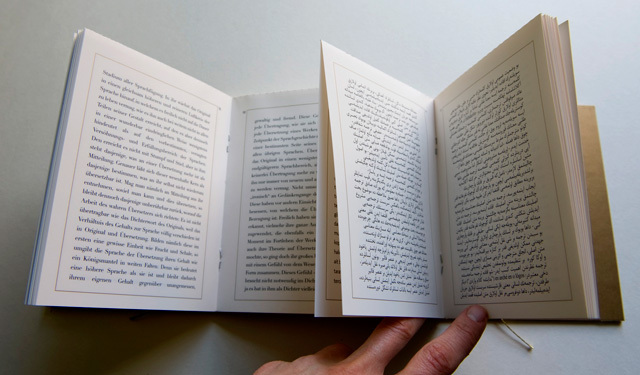 The most natural step was the publication of The Task of the Translator (‘Die Aufgabe des Übersetzers/ مترجمك'), where the process of the translation of language is described – so a book was created. 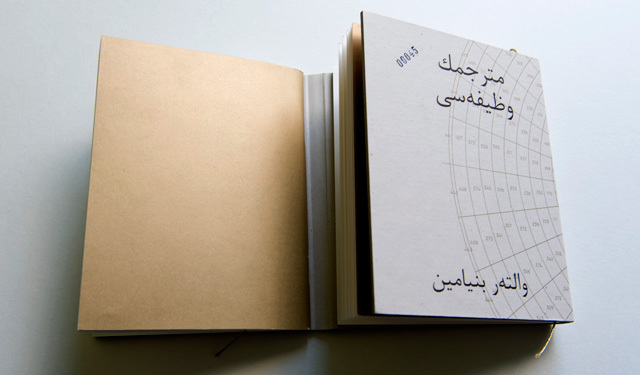 Alongside the German original’s translation into Ottoman Turkish and modern Turkish, this small-format artist’s book includes a phonetic transliteration of the Ottoman translation in the Latin alphabet so that the reader can ‘hear’ the Benjamin text in Ottoman Turkish. Following the publisher of Tableaux Parisiens, the artist had 500 numbered copies of the book printed. 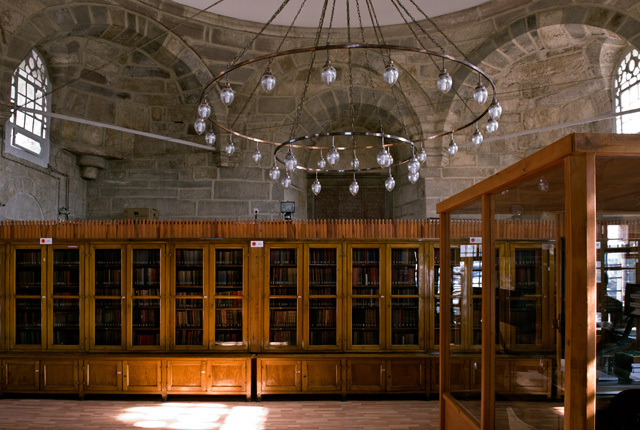 Another part of the project is a photograph of the interior of the Ağa Yusuf library in Konya, which holds a collection of books in Ottoman Turkish, where the Benjamin text can be seen among the pre-1928 publications. The book (copy no. 001) had been ceremonially presented to the library. The gesture reflected a desire to restore the Benjaminian thought on translation to the culture of the late Ottoman Empire and the early Turkish Republic, as well as being a fantasy on the mystification of history. 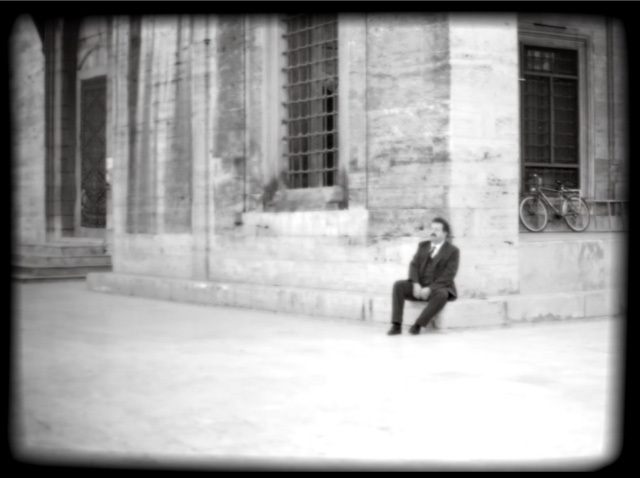 Following the trope of mystification, the artist directed a para-documentary, A Walk to the Library, about an imagined visit by Walter Benjamin to Konya in 1929, after the language reform had been introduced. The role of the great philosopher was played by Henryk Rajfer, an actor in the Jewish Theatre in Warsaw. The film's Benjamin wanders around downtown Konya, obviously a stranger, visits the cemetery, watches people, and finally goes to the Ağa Yusuf library, a building that is in fact part of the Mevlana mosque. There, he browses through books, studying the unique Ottoman calligraphy and typography. 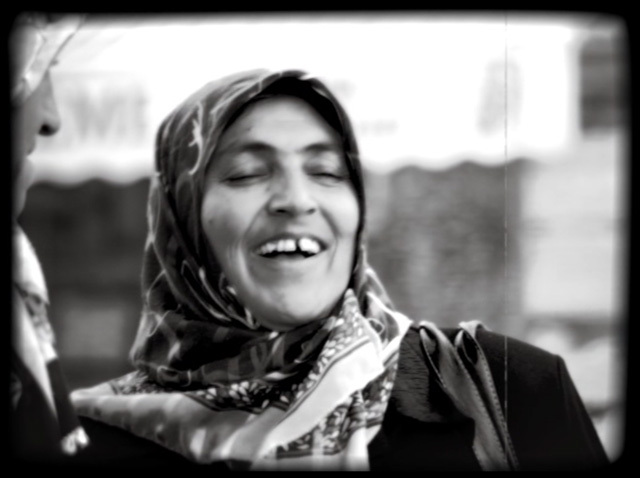 The theme of the visitor’s strangeness, his slow peregrinations around Konya, is interspersed with a rapid rhythm of onscreen intertitles describing the successive stages of the linguistic reform. Ottoman letters morph into Latin, Persian letters into Arabic. 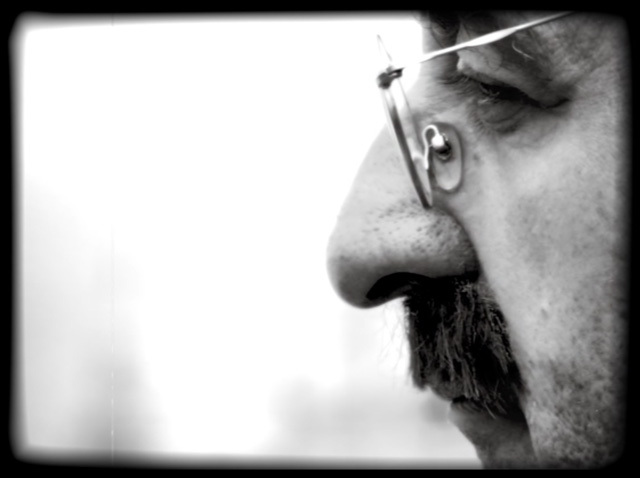 The film concludes with the last title card: ‘89 years after being written, Walter Benjamin’s text The Task of the Translator has been translated to Ottoman Turkish’. And finally, the main element of Benjamin in Konya: a public project. It is a field of text (a fragment of The Task of the Translator) etched into marble slabs which, arranged in a spiral, delineate the centre of a square near the Şerafettin Cami mosque and the former town hall. The spiral’s central part contains the Ottoman text, then the text of the German original unfolds, followed by the modern Turkish translation. 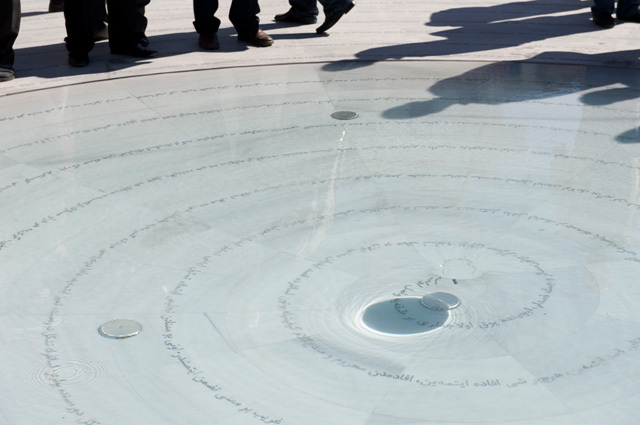 The field of the Ottoman text forms a shallow basin over which water swirls, forming a small vortex in the middle. The water protects the text from profanation, because since the time of the reform Perso-Arabic script has been reserved for the Qur’an and other holy scriptures. With time, the water will wash away the letters of the Ottoman text while the remainder will be worn away by the feet of passers-by. My City project is conceived and implemented by the British Council in collaboration with Anadolu Kültür and Platform Garanti Contemporary Art Center. My City forms part of the Cultural Bridges programme for EU-Turkey civil society dialogue funded by the European Union.